Recently Mark and I got to share in the wedding day of a really fantastic couple, the vivacious and beautiful Steph and her cool man B’Jay. I first met these guys over a year ago when they came for a ‘show and tell’ cruise with me down the beach and I remember how we talked about what they wanted for their day and they remarked that all they really wished for was that it be filled with lots of love and fun. Well I can honestly attest that their day certainly achieved that and more. Our part on their day started with Mark and ‘Stormy’ heading over to Torquay to collect B’Jay and his mates and then taking them for a relaxing cruise around the local area with a nice cold beer in hand. B’Jay was quite calm and very much looking forward to marrying his special lady and apparently couldn’t wait to get to Torquay Back Beach for the ceremony to begin. His mates were great value and really helped to keep B’Jay grounded and laughing with some great moments, usually at the expense of making fun of B’Jay and each other. Boys will be boys! ‘Dormy’ and I also headed to Torquay where I arrived with plenty of time to meet Steph’s lovely Mum and Dad and her gorgeous Bridesmaids. Steph was beautiful and glowing on her special day and displayed no nerves at all and in fact remarked that she couldn’t wait to get there and marry B’Jay. I have to say that this lovely group of ladies were so much fun and Steph had indeed chosen well such a great bunch of special, effervescent and gorgeous woman to share her day. After a few photos Steph and her Dad travelled in a very cool 66 Mustang while I was lucky to take her stunning and very entertaining Bridesmaids in ‘Dormy’. Now I had to of course show off Steph and her ladies so we made a bit of a detour and I took them down along The Esplanade with lots of beeping, waving and shouts from locals and tourists alike. We then arrived at the Back Beach and ‘Kombi Karma’ was certainly with Steph and B’Jay as the weather for their day was picture perfect as Steph and her very proud Dad made their way down the beach towards her patiently waiting man. What followed was a really fantastic ceremony which certainly ticked all of the boxes and then some. Like all ceremonies there were many wonderful moments with it all highlighting the very obvious love and affection that B’Jay and Steph have for each other. I have to say that one very entertaining moment was when the wedding rings proved to be unable to be separated, rather tight knot apparently. This was much to the discomfort of the Best Man but proved to be very humorous and again helped to add some more fun and enjoyment to the day. After congratulations and photos with family and friends we managed to load everyone up and it was in a double Kombi, Mustang convoy that we took this hi-spirited and exuberant group of folks off for Bridal Party photos in the local area under the direction of great photogs Lee and Lisa from www.twoclickphotography.net We had a really terrific time and both Mark and I really enjoyed ourselves with them all, especially the great convoy cruise down the highway into Geelong to ‘The Pier’ for their party and celebrations to really begin. Regretfully like always it was very quick goodbyes to everyone as we dropped them off at ‘The Pier’. However as Mark and I drove home in the afternoon sun in ‘Dormy’ and ‘Stormy’ I could not help but have a big smile on my face after yet another outstanding day with some more amazing people. got to be happy with that! 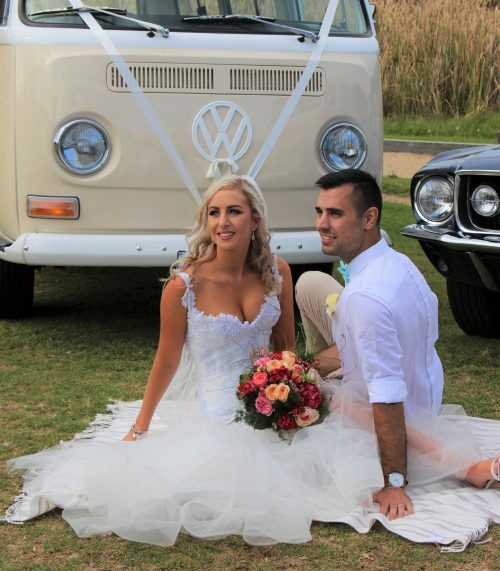 Thank you so much Steph and B’Jay for letting us share in your special day and we certainly wish you both much love, joy, health and happiness and of course continued great ‘Kombi Karma’ for your future together.